A combination of retinographic and behavioural observations suggest that foxes, like most dogs, can see colour, albeit to a lower extent than we can. Foxes possess dichromatic (two-colour) vision that essentially makes them red-green colour blind. The result is that foxes probably see the world in more pastel shades than vibrant colour. The lack of a fovea in canines also implies that humans have a better eye for detail than dogs, while their abundance of rods on the canid retina suggests dogs can discriminate between shades of grey and pick out movement better than we can. Vision is a complicated sense that is as much a response to psychology as neurology. Colour is a very personal experience and what one person might call yellow, another might call gold. We can, however, understand a bit about the potential for colour vision by looking at the construction of the retina. Before we do that, we need a little background. At school, you were probably taught about something called the Electromagnetic Spectrum (or EMS), which represents the complete range of electromagnetic radiation; from the longest radio waves to the shortest cosmic waves. We need not concern ourselves with what electromagnetic radiation actually is, but we should be aware that we can only see a small percentage of it. The wavelengths of the spectrum that we can see fall into the category of visible light. We classify electromagnetic radiation based on its wavelength (see figure below). Wavelengths of radiation are measured in units called nanometres (abbreviated to nm). One nanometre is one thousand-millionth of a metre or, to put it another way, there are 10 million nanometres in a centimetre or nearly 26 million to an inch. 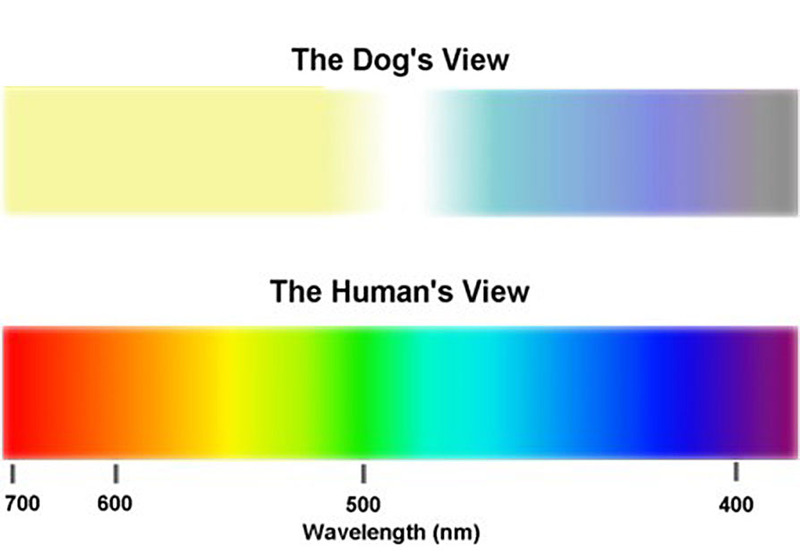 Visible light is radiation with a wavelength of between 380nm and 780nm – wavelengths between these values represent different colours of light. For example, we see light with a wavelength of 740 to 620nm as red, while that between 575 and 500nm appears green. We can see the world around us because our eyes pick up visible light reflected by objects in our surroundings. Light bounces back from objects and passes through our pupil, striking the light-sensitive membrane at the back of our eye called the retina and stimulating its cells to send electrical impulses to the brain. 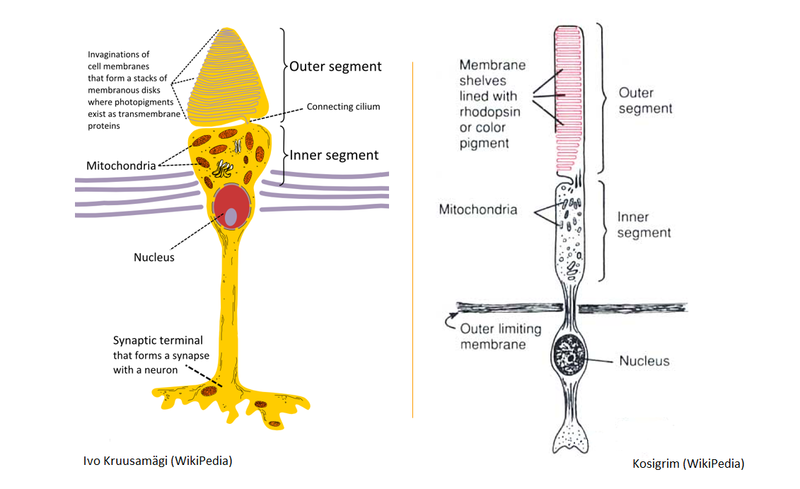 Cells on the retina can be divided into two broad types: those that are very sensitive to light but which share connections to the brain with other cells, called rods; and those that are sensitive to specific wavelengths of light and have their own connection to the brain, called cones. The way the mammalian visual system works is fascinating, but out of the scope of this article. Sufficed to say their structure and wiring means rods are used in low light (so-called scoptic or twilight vision) and provide a low resolution greyscale image, while cones are employed in bright light and provide us with a high resolution colour image. Cone cells contain pigments that are sensitive to specific wavelengths of light, which means the cells themselves are stimulated by certain frequencies and this allows us to determine the colour of an object. Among the mammals, we recognise three different ‘types’ of cone cell, separated by the frequency of their colour pigment: red cells (peak sensitivity of 570nm); green cells (535nm); and blue cells (445nm). The colours we see are determined by which combination of sensors are excited by the light bouncing back off an object. A Royal Mail post box, for example, appears red because it absorbs all colours of visible light except red, which it reflects. Most humans have all three of these pigments, which means we can sense almost any gradient of colour when red, green and blue are mixed. The presence of three colour-sensitive pigments is referred to as trichromatic vision. Humans are not the only mammals with three cone types, cats as well as chimps and some African monkeys also have three colour-sensitive pigments. That’s not to say, however, that the presence of these pigments means that they see colour in the same way as humans. Cats, for example, have three cone pigments, but they have slightly different peak sensitivities, leading to a more pastel-coloured vision, with less saturation than humans can register. There are also some inherent pitfalls in trying to assess the presence of colour vision based solely on the number or types of cone cells on the retina; not least that colour is highly subjective. I might call something red, while you might think that it was pink and someone else might vote for orange. Ergo, generally a combination of retinal studies to assess the presence of cones and psychometric tests are needed to assess the colours that animals are able to see and respond to. Vibrant vulpids or pastel pooches? To the best of my knowledge, nobody has subjected foxes to psychological experiments to assess their ability to recognise and interpret colours. Nonetheless, studies on their retinal topography (i.e. studies looking at the type and distribution of cells on the retina) have shown that foxes certainly have the ‘equipment’ to register some colour, although the degree to which foxes (and dogs in general) can resolve colours is probably less than ours. Indeed, given the roles that dogs play in our daily lives, it is something of an oddity that there are so few studies looking at canid vision. Observations on the activity patterns of canids do suggest that they are “visual generalists”, able to work in conditions of various light intensities. Observations of fox movements suggest that they are able to cope with a wide variety of light conditions; foxes are active during dawn, daytime, dusk and throughout the night (are arrhythmic). Nonetheless, much of a fox’s hunting and foraging occurs from dusk to dawn and, as might be expected, studies on canid retinas have revealed a predominance of rod cells (about 97% in dogs and wolves); this suggests their sight in dim light and ability to differentiate shades of grey and movement is superior to ours, but their recognition of colour is likely to be poorer. In a 1993 study published in the journal Visual Neuroscience, a team at the University of California looked at the photopigments (light-sensitive chemicals) of dogs and foxes. The optometrists found that all the canids in their study possessed two cone pigments; one with a peak sensitivity of about 555nm (light green) and another with a peak between about 430 and 440nm (dark blue/purple). In the Red fox (Vulpes vulpes), this second (short-wavelength) peak was at 438nm. These findings imply that foxes have dichromatic (two-colour) vision, similar to that of a human deuteranope. In other words, it suggests that foxes are red-green colour blind, meaning that reds appear a greeny-yellow colour. Studies on the distribution of rod and cone cells on the retinas of canids has shown that their resolving power (i.e. how clearly they can see detail) is lower than ours. You have an area in the middle of your retina that is composed entirely of cone cells; it’s called the fovea and you’re using it to read this article. Without the fovea, you would struggle to make out enough detail to read the text on this page. Dogs do not appear to have a fovea, suggesting their ability to discriminate details is less than ours. Indeed, some authors have estimated that a dog’s eye for detail is about six times worse than ours. Similarly, a recent study by a team of biologists at the University of Vienna reported that brightness discrimination ability in dogs is about two-times worse than in humans. In conclusion, we can say that foxes, and dogs in general, are not colour blind; they possess dichromatic vision that essentially makes them red-green colour blind. The lack of a fovea in canines also implies that humans have a better eye for detail than dogs, while an abundance of cones on the canid retina suggests dogs can discriminate between shades of grey and pick out movement better than humans.